Before beginning a property search, buyers should understand the different types of property that are available for sale in their market. For instance, Manhattan has four unique property types, including: cooperatives (co ops), condominiums (condos), townhouses (or brownstones) and condops. Manhattan real estate is composed of approximately 25% condos, 70% coops and 5% condops and townhouses. In Miami, there are only two property types: condos and free-standing homes. A good real estate agent will know all the pros and cons about buying a condo, coop, condop or free-standing home. A condominium is real property, like owning a home, in which the owner holds title by deed of an apartment and a percentage of its common areas. Owners pay property taxes to the city and monthly fees in the form of common charges to the Condo Board, which oversees the operation of the Condo. Traditional financing can be obtained for Condo purchases with a 20% down payment in most cases for U.S. residents and a 30% down payment for foreign nationals. For many, the pros of buying a condo unit will outweigh the cons. Purchasing a condominium is much more democratic than purchasing a coop, as condos are much less restrictive and open to anybody who has funds to buy one. Generally, condos allow owners to sublease their apartments with few restrictions. In addition, condos allow for foreign ownership, have fewer restrictions, require lower down payments, and are easier than coops to finance. Most condos have been built in the last 30 years and include many amenities that current owners and tenants expect, including fitness centers, swimming pools, lounges, etc. These amenities are not found in most coops. All these features make a condo more marketable, increasing its saleability. NYC condos comprise only 25% of total residential properties for sale in Manhattan. This supply constraint and the desirability of new condos that have many amenities make condos more expensive than coops. Investors and foreign buyers, therefore, should focus their property searches on condos. Coops (or Cooperatives) are buildings owned by corporations that sell shares of stock in a corporation to shareholders in return for long-term proprietary leases. The proprietary lease allows a shareholder that is buying share to use a particular apartment in the coop building. The larger the apartment, the more shares the shareholder will hold and the higher share of maintenance costs the shareholder will pay. Maintenance charges are paid to the corporation and include all the building expenses, including real estate taxes and mortgage interest if the corporation holds a mortgage on the building. Comparatively, condo buildings are prohibited from obtaining mortgages, so condo HOA fees can never include mortgage interest. There are many coop pros and cons to buying a co op. First, cooperatives will have a lower purchase price than condos because they are older and they represent 70% of the market. Coops, however, can make up any rules they want and their shareholders must adhere to those rules. Under cooperative ownership, shareholders are generally required to occupy their apartments as their primary residence. In addition, coops have rules sharply limiting or prohibiting subleases, so investors should not be looking at Coops as a viable investment. One common co op New York rule is the prohibition of foreign ownership. Generally, coops prohibit foreign buyers since it may become impossible to sue a foreign national who has the bulk of their assets and sources of income outside of the United State. Even if the cooperative corporation obtained a judgment against a foreign owner, it would likely be uncollectible if the owner’s assets were sitting 4,000 miles away in another country. Financing of a Coop requires using a personal loan rather than a mortgage. The cooperative corporation will dictate the amount of purchase price that can be financed, equal to 50% - 75% of the property value. As with a mortgage, interest on the personal loan is deductible for tax purposes. One common feature of coops is a flip tax, generally 2-3% of the sale price of the apartment, paid by the seller to the cooperative corporation upon the sale of an apartment. Potential owners (and tenants, if allowed by the Board) must be interviewed by the Coop Board of Directors and present formal applications to the Board for approval. This process can take months, not weeks, as with a condo. While condos also require an application, buyers and renters are not interviewed by the condo board and the approval process is much easier. The term condop is used in new york city real estate circles as a coop with condo rules. Technically, however, a condop is defined as a residential coop that has sold its ground floor as a commercial unit. In practice, however, the term is used as meaning a coop with condo rules. Under condo rules, condops allow subleases and foreign ownership. Often buildings built on land leases will fall in the Condop category. A building with a land lease requires owners to pay rent on the underlying land over a long period, usually 99 years (like property in London). These leases, in practice, are usually renewed before the land lease expires. Owning a Townhouse, or Brownstone, as some are called, is like owning a single family home. The owner receives title by deed and is the sole party responsible for paying taxes and building maintenance. Many people use the terms of Townhouse and Brownstone interchangeably, however, a Townhouse can be sheathed in red brick, limestone, brown sandstone, or wood, whereas a Brownstone is sheathed in brown sandstone. A Town house is a multi-story dwelling (attached or detached) built close to the street and scaled similarly to surrounding houses. Manhattan has many types of Townhouses including Federal, Greek Revival, Gothic Revival, Italianate, and Second Empire architectural styles of the early- and mid-nineteenth century, as well as the Neo Grec, Romanesque, Renaissance Revival, and American Colonial Revival styles. Townhouses (and Freestanding Homes). A Townhouse buyer has two options – a single-family Townhouse or multi-family Townhouse. Deciding which to choose will depend upon the owner’s needs for freedom and privacy, as the former would offer the most of each. Buying a multi-family, however, can make homeownership more affordable as an owner will collect rent from tenants. New York City Townhouses account for only 3% of property sales in Manhattan, as there were only 196 transactions. The average sale price for a Manhattan-wide single-family Townhouse was $7,948,000 with an average size of 4,909 sq. ft. or $1,619 per sq. ft. (or $17,428 per sq. mt.). For the luxury market, the top 10% of all sales, the average sale price for a Manhattan-wide single-family Townhouse was $18,130,000 for 8,914 sq. ft., or $2,034 per sq. ft. (or $21,893 per sq. mt.). The primary factors that provide value to a Townhouse are 1) whether or not there are existing rent-control tenants, 2) location, 3) the condition of the building, and 4) frontage, or width of the building. If you decide to go the multi-family route, remember that New York City has formidable citywide rent controls (or price controls) that may apply if there are six or more units in the building. It would be wise for a buyer to steer clear of buildings with rent control or rent-stabilized tenants in place since once the property transfers to the new owners, so do all the rent controls. The new owner likely won’t be able to evict tenants of the property if the owner decides to make a single-family home. Rent Control favors the tenant, so landlords must know these rules inside and out. In searching for New York City townhouses, buyers should search for buildings with “Market Rate” or “Free Market” tenants. That is not to say that an investor should never purchase a property with rent control tenants. However, the investor must know that his freedom will be severely restricted by NYC rent control laws and, therefore, the value of the property will also likely be impaired if rent control tenants are in place. New York City Townhouses are valued based on which block they are on. In addition, each block’s configuration impacts value, since there is more perceived value in a block that has rows of uninterrupted Townhouses than a block with a large building smack-dab in the middle of the block that is interrupting continuity. On both the Upper East Side and Upper West Side, the most expensive Townhouses are generally those blocks adjacent to Central Park in the 60s and 70s. On the Upper West Side, Townhouses that are on blocks adjacent to Riverside Park in the 70s and 80s are more expensive than those adjacent to Central Park in the 80s and 90s. On the Upper East Side, Townhouses on blocks adjacent to Park Avenue in the 60s, 70s, 80s and 90s are more expensive than the remaining Townhouses in the area. Most New York City Townhouses were built in the 19th Century, so they are the oldest buildings in the city. Accordingly, a buyer will have to decide how much renovation and reconfiguration that he or she is willing to make in getting the Townhouse in condition to meet the buyer’s needs. While many Townhouses have been completely restored or renovated, many have not. Generally, frontage, or width of the building, has a great impact on the value of a Townhouse. A buyer would pay much more for a 24-foot-wide Townhouse than for 15-foot-wide Townhouse, all things being equal, including the total square footage. If you want us to prepare a search of Townhouses for you, please go to our Tailored Search. A townhouse refers to the style of construction. Townhouses usually have at least 2 stories and are connected to one another in a row. While it is like a house, where the owner owns the structure and the land, it is not free standing. A townhouse shares one or more walls with other independently owned units. Maintenance costs for the home is determined by the community's homeowners association. In contrast, a condo building is a building with separate unit owned by individual residents. Residents own and maintain the interior of their unit, but don't directly own the property on which the building sits. Investors are buying up apartment buildings in NYC and converting them back into single-family homes. 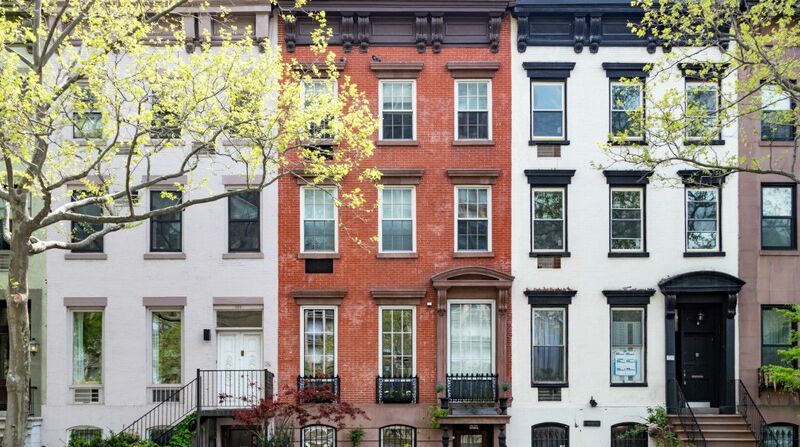 Manhattan townhouse NYC sales, in particular, are becoming increasingly popular. In the last three years more single to triple family units have been bought than in the previous three years combined. But why is this happening? It appears that luxury real estate changing hands amongst wealthy investors is more profitable than dealing with smaller sales from the ordinary homeowner, who is buying property for completely different reasons. Long-term buyers are finding it so difficult to find a single-family home in Manhattan that they are creating their own. Ironically, many of these townhouses were initially single-family homes to begin with. Now, townhouse owners are investing millions to renovate and re-build them back to their original layouts from their current multi-family state. This often involves redoing the plumbing, wiring and tearing out walls placed in after the fact. Manhattan real estate agents estimate that the average complete townhouse in the Upper West Side costs approximately $10 million. Renovations to revert the building to its initial layout can set them back an additional $3 million to $5 million. On the flip side, multi-family rentals are becoming more popular in the city. The post 2008 employment environment is still uncertain, meaning that more and more people are renting, sometimes with several other families. It is not the ideal scenario for an owner. With every new member on the contract, the odds of rent being missed, or problems arising increases. In light of a tenuous rental market, the idea of renting out individual units in one’s townhouse becomes less appealing, perhaps indicating why more owners are opting to convert multi-family townhouses into single dwellings, and catering exclusively to the luxury market in Manhattan, as opposed to the general population. It is one thing to own a residence for your family to put down roots, and another to analyze the current status of the housing market in terms of the rental potential and ease of resale down the road. With multi-family rentals becoming more popular, it looks like the renovations to convert to a single-family home may be well worth the investment. Now, hopefully, you'll now understand the difference between co op vs condo buildings, as well as other type of properties available in NYC and Miami.